Our cottage is in the heart of Chittlehampton which is a lovely Devon village of about 800 people. It has a thriving village life centred around the local pub and also easy access to Exmoor and the North Devon coast which met our needs for a home from home. Living Area has a 2 seater sofa and 2 chairs on an oak floor. It offers a TV (Freeview), DVD, CD and Radio. It is also wired for easy HDMI connection to your computer. Fully fitted kitchen with electric oven and gas hob, extractor fan, dishwasher, under counter fridge/freezer, microwave, toaster and kettle. Selection of pots, pans, crockery. Washing machine in cupboard on landing. Ideal as a base for golf breaks, with High Bullen just 4 miles away. Saunton and Royal North Devon are about a 30 minutes trip. There is also Ilfracombe (21 miles), Woolacombe(20 miles) , Libbaton(6 miles) and Portmore (7 miles) . Outside: The cottage has an outlook over the village square with ample free parking. Although not reserved it is likely that car parking spaces immediately outside the cottage will be available. There is no garden but the village square which has some benches closeby, perfect to sit with a cup of coffee and watch the world go by. Utility Room: Utility cupboard housing washing machine, hanging space, ironing board and iron. Boiler cupboard with airer which is always warm so can be used to dry or air wet clothes. Cleaning / Towels / Linen / Maid service: Bedlinen and towels are included. Extra bedlinen is available and stored in chest of drawers in bedroom 1. Other: Dining Area with oak table and 4 chairs, cutlery and crockery available. There are also some games, books and DVDs . Thoroughly enjoyed our stay. The cottage was spotless and had all we needed. Locals are very friendly and The Bell serves excellent food. Would like to thank Chris for accommodating us with the extra nights stay. All in all a break to remember. Excellent. Lovely cottage in a pretty location. Lovely little cottage in a pretty village. Peaceful location.Excellent welcome pack and everything you need for a comfortable stay. Cosy and very clean, had everything we needed. The HomeAway app didn't work, all the info for arrival details we had to email the owner for. Brilliant cottage and excellent owner. Shall not be using homeaway again as couldn’t find Company contact details on terrible website. We were very pleased with the property, and although there were only two of us, it would easily accommodate four. Parking in the square was a plus and there was always space available. A very generous supply of cereals, tea, coffee and other essentials awaited our arrival. The property was spotlessly clean, cosy and welcoming. It was interesting to compare the old photograph of the property and square, with how they are today. Has the pump been moved? I'll let you decide! The proximity of the church and the splendid Bell Pub was a definite plus. Tradition in spadesful. Best to book to eat in the pub - tasty, hearty, good value food. The other bell, or bells, in the church, added to the overall charm and timelessness of this deepest Devon bolt hole. What a charming cottage in an equally charming village. This home away from home had everything we needed for a comfortable stay. The milk, bread and butter were a lovely and thoughtful touch upon our arrival. The locals made us feel so welcome we may return. We spent many an evening in the local pub and walking the hills around the village. Love it here. Chittlehampton is a historic village and was first settled by the Saxons during their 8th century invasion of Devon. The village is the home of St. Hieritha's church and holy well. Until the 16th century many people made pilgrimages to Chittlehampton to visit the well. The church, has the finest tower in Devon, is large and of the late Perpendicular period. St Hieritha, a 7th-century saint, is said to have been buried under part of the church. 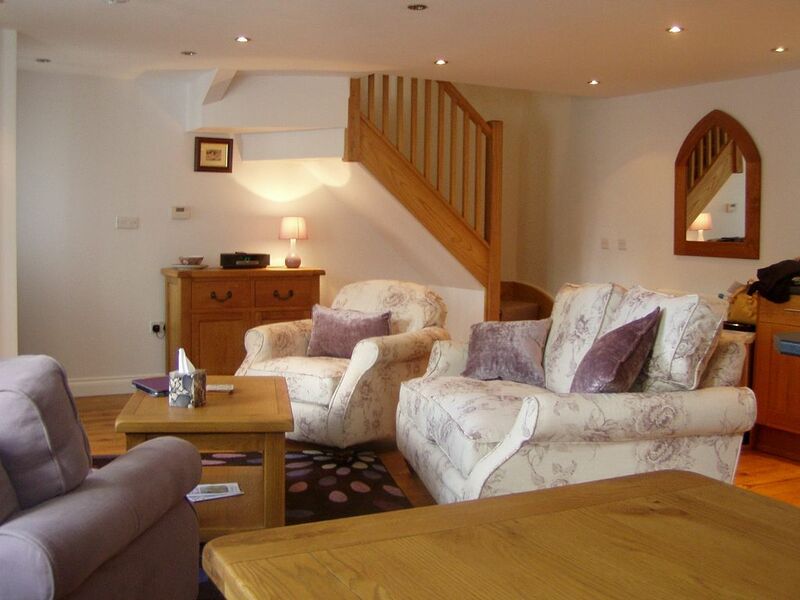 The cottage is very close to Exmoor which is popular with walkers. The Tarka Trail is also close by and bikes can be hired at certain points along the trail. The North Devon beaches are within easy reach, Instow beach is a favourite which is about 30 minutes from Chittlehampton. Croyde, Woolacombe , Saunton and also not far . Ilfracombe is just 21 miles away. Chittlehampton is situated 5 miles west of South Molton and 9 miles south of Barnstaple. Booking Notes: You can book online using our website prospect-cottage.co.uk or by contacting us directly by phone or email. A 35% deposit is payable at the time of booking, the balance is due 8 weeks before your break. You can pay by cheque, bank transfer or credit or debit card Changeover Day: During peak period our changeover day is Friday , however throughout the rest of the year we are flexible on our changeover days. Visitors can arrive from 4pm on arrival date and should leave by 11am on their departure day.